Graham Hill arrived in Mexico with 39 points in the World Championship battle but knew that he would have to drop three points if he scored again. John Surtees had 34 points and could count anything he scored. Jim Clark was the outsider with 30 points but a victory with the others failing to score would give him the title and he had won more races than his rivals. Clark had not given up and set a scintillating pace in qualifying with a pole position time which was nearly a second faster than his nearest rival Dan Gurney (Brabham). The blue and white Ferraris of Lorenzo Bandini and Surtees were on the second row while Mike Spence in the second Lotus was alongside Hill on row three. Ferrari entered a third car for the event for Pedro Rodriguez. Clark's hopes of World Championship success were slim but they looked decidedly better at the start as he took off into the lead. Graham Hill dropped to 10th when the elastic on his goggles broke just before the start while Surtees's car was misfiring badly and he was down in 13th place at the end of the first lap. Surtees was in luck, however, as his engine cured itself and he was able to begin a charge through the field. Hill too was able to make up places and on lap 12 he moved into the vital third position which gave him the one point he needed to stay ahead of Clark. Hill remained under threat from Bandini and on lap 31 the two cars made contact and both spun. This enabled Surtees to take third place. Hill rejoined by he had damaged the exhausts on the BRM and had to pit and so his chances of winning the World Championship depended on his rivals retiring. With Gurney second, Surtees could not win the title if Clark won the race and as Bandini's flat 12 Ferrari was quicker than the V8 car being used by Surtees the Italian moved up into third. It seemed that Clark was going to win a second title but with seven laps to go the Lotus began leaking oil. On the last lap the Lotus's engine seized up. Gurney went through to win but now Surtees's title depended on Bandini moving over to allow him to finish second. 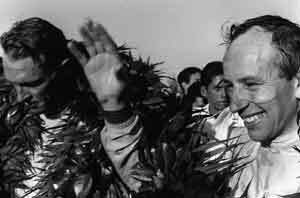 The Italian did exactly that and Surtees became the first motorcycling World Champion to win a world title on four wheels as well.